Posted by admin in El Salvador, natural hazards, San Salvador. A little while ago we ran a report here at The Volcanism Blog on San Salvador volcano in El Salvador, which overlooks the country’s capital city (also called San Salvador). This massive compound volcano, which last erupted in 1917, presents – in addition to its violent eruptive character – a serious non-eruptive volcanic hazard in the form of lethal and destructive landslides generated by collapses of its unstable flanks. The populations of communities around the volcano have been campaigning to get mitigation measures put in place to protect them from this threat. The appearance of a new large crack in the flank of the volcano that faces the capital has apparently helped to concentrate minds on the potential dangers. Last week the Salvadorean ministers of the interior and of public works visited the area to discuss what measures the government may take to deal with the problem. The mitigation techniques being considered include the planting of ‘living barriers’ of foliage on affected slopes and the construction of dykes and drainage channels. The main element is planned to be an 800-metre long and 10-metre wide drainage channel capable of carrying the large volumes of water runoff produced during the rainy season, which runs from May/June to November. A total of $10 million (or possibly $6 million, initially) is being sought from the government’s Special Investments Fund to begin work on the project. The Ministry of Public Works (MOP) is now beginning a geological, geotechnical and hydrological survey of the area, which is expected to take four weeks. The MOP says that the work itself will probably be carried out this winter, once the imminent rainy season for this year is over. When we think of the hazards presented by volcanoes, eruptions naturally come to mind: but volcanoes don’t have to erupt to be lethal. San Salvador volcano (or Quetzaltepec) in El Salvador, a complex compound volcano with a summit elevation of 1893 metres has a long history of violent eruptions, but has not erupted since 1917. 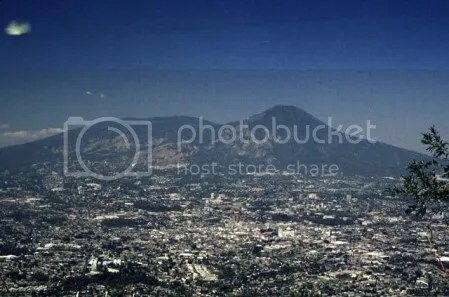 The capital city of El Salvador, also called San Salvador, stands at the foot of the volcano, and as it has grown it has encroached increasingly upon the volcano’s slopes. As a result, any eruption of San Salvador volcano would have very serious consequences. Even without eruptions, however, the instability of the volcano’s slopes presents the city with another serious hazard: landslides. 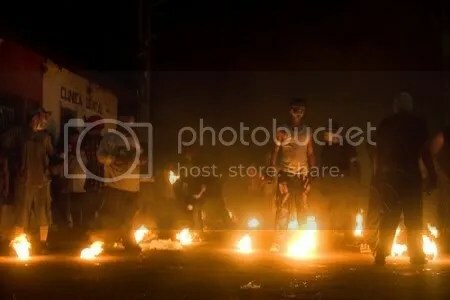 The Salvadorean newspaper Diario Co Latino reports this week that community leaders from around San Salvador are calling on the government to recognize the hazard posed by volcanic landslides and declare a state of emergency for the area north-east of the volcano, between San Salvador and San Vicente volcanoes. They recall that a 1934 landslide from the latter volcano killed an unknown number of people in the village of Tepetitan, and that in 1982 heavy rainfall triggered a landslide on the flanks of San Salvador’s El Pichaco peak (on the right in the picture above) which descended more than 4 kilometres from its source and swept into the north-western part of the city, destroying homes and killing 300-500 people. There have been further potentially dangerous landslides in January 2001 and October 2008, when a large landslide took place which could have caused a similar disaster to that of 1982, if the debris flow had not taken a different course during its descent. With this hazardous history in mind, along with other even deadlier examples of volcanic landslides such as Casita (October 1998, more than 2000 people killed), the concern expressed by the San Salvador community leaders is understandable. They are petitioning the national government for a thorough scientific survey of landslide-prone areas, improved monitoring and mitigation works, and the relocation of communities particularly at risk from landslides.